SACRAMENTO, Calif. (May 19, 2018) – The fabled history of the Harley-Davidson Sacramento Mile presented by Cycle Gear saw another outstanding entry added to its annals on Saturday night at Cal Expo Fairgrounds, with three of American Flat Track’s all-time greats taking center stage. Following an initial feeling-out stage in which a handful of AFT Twins presented by Vance & Hines competitors made their presence felt at the front, defending Grand National Champion Jared Mees (No. 1 Indian Motorcycle Rogers Racing SDI Scout FTR750) and retiring legend Kenny Coolbeth Jr. (No. 2 Nila Racing, Columbia Avionics Indian Scout FTR750) broke free from the pack. The two superstars stretched their advantage over third to nearly two seconds while setting the stage for an epic showdown to the checkered flag. However, Bryan Smith (No. 4 Indian Motorcycle Racing backed by Allstate Scout FTR750) – owner of seven straight Sacramento Mile victories – simply refused to be left out of that fight. He clawed and scratched his way into contention, officially turning the race into a three-way shootout over the contest’s nail-biting final five miles. In the end, series steamroller Mees overcame Coolbeth, Smith, sentiment and the storybook finish to notch up what’s already his fifth victory of the young 2018 season. Coolbeth attempted a last-lap strike but fell 0.018 seconds short at the checkered flag. And while Smith was disappointed not to have extended his Sacramento Mile win streak to a nearly unfathomable eight straight, his heroic come-from-behind performance was all the more inspiring considering it was his return ride after breaking his left fibula just three weeks back at the Texas Half-Mile. It seems the extended Indian Wrecking Crew is in need of an even more intimidating moniker. In addition to works runners Mees (1st), Smith (3rd), and Brad Baker (No. 6 Indian Motorcycle Racing backed by Allstate Scout FTR750) (4th), Coolbeth (2nd), Henry Wiles (No. 17 Wilco Racing/Willy Built/Bandit Industries Indian Scout FTR750) (5th), Davis Fisher (No. 67 RMR/Double D Performance Indian Scout FTR750) (6th) and Chad Cose (No. 49 Indian Motorcycle of Oklahoma City Scout FTR750) (7th) combined to claim the top seven positions on the night for Indian Motorcycle. Fisher, by the way, notched the fastest lap of the night. Jake Johnson (No. 5 Estenson Racing Yamaha MT-07) was the best of the rest in eighth, with Briar Bauman (No. 14 Zanotti Racing Kawasaki Ninja 650) and Brandon Robinson (No. 44 Harley-Davidson Factory Flat Track Team XG750R) completing the top ten. The evening’s storylines were not monopolized by the top ten, however. In the what-might-have-been department, Jeffrey Carver Jr. (No. 23 Roof-Systems/Indian of Metro Milwaukee Scout FTR750) saw his night come to an early conclusion – and with it, a strong bid at a Main Event victory ripped away. Carver was black-flagged at the tail-end of Semi 1 due to a smoking machine while holding down the race lead over Mees. On a brighter note, Ronnie Jones (No. 266 Estenson Racing/Loral Lake Racing Indian Scout FTR750) reestablished his own record as the oldest rider to make an AFT Twins Main Event. 57-year-old Jones is the owner of 10 career AFT Twins victories, the first of which came almost four decades ago and the most recent nearly a quarter century back. He has qualified for AFT Twins Main Events across five different decades – the ’70s, ’80s, ’90s, ’00s, and ’10s. And Jones was not merely making up the numbers in Sacramento on Saturday night; he finished second to Coolbeth (a relative youngster at 41) in Heat 3 and finished 14th in the Main. Reigning AFT Singles champion Kolby Carlile (No. 1 Estenson Racing Yamaha YZ450F) needed a result in the worst way, and did he ever get it. Carlile came through on the final lap following a titanic six-way struggle to score a spectacular victory by a scant 0.013-second margin of victory that felt even tighter than that. 2016 class champ Ryan Wells (No. 94 RMR/Al Lamb’s Dallas Honda CRF450) came from nowhere to dive-bomb into the lead entering Turn 3 on the final lap but couldn’t hold the ambitious line. Carlile successfully countered and then immediately turned his attention to holding title contenders Dan Bromley (No. 62 KTM North America/Bromley Motorsports 450 SX-F) and Brandon Price (No. 92 Parkinson Brothers Racing/DPC Racing Honda CRF450R) at bay as they charged down the straight to the checkered flag. The riders swung three abreast with Carlile narrowly holding strong at the line. Price hit the stripe in second, another 0.013 seconds ahead of Bromley, to up his slim points advantage over his rival to four (105 to 101). Still, Bromley had to be pleased to finish on the podium, considering he was fortunate just to be in contention. The Daytona TT winner was forced to call upon his one and only provisional start for the entire season simply to advance to the semis after suffering a mechanical DNF while fighting for the lead in Heat 2. For Carlile, the win was a double dose of what he needed. He entered 2018 desperate for a win after claiming the ’17 crown without a race victory. That desperation was upped considerably by a less-than-ideal start to his title defense that saw him come into Sacramento ranked all the way down in 10th. Carlile has now jumped to eighth with 64 points after becoming the sixth rider in six races to win an AFT Singles Main Event this season. Wells recovered well enough to finish fourth, while Tristen Avery (No. 16 Ron Ayers/Mr. Sign Honda CRF450R) and Jesse Janisch (No. 132 Roof Systems/West Bend Harley-Davidson-backed Yamaha YZ450F) finished fifth and sixth, respectively. Three-time Sacramento Mile winner Shayna Texter (No. 52 Husqvarna Motorcycles/JCS Racing FC450) finished at the head of the second group in seventh after fighting her way forward from outside the top ten. 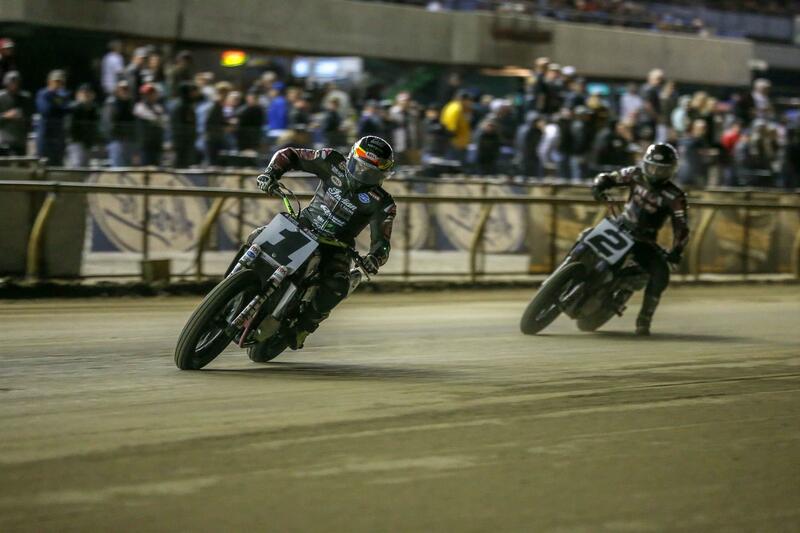 Catch the NBCSN Premiere telecast of the Harley-Davidson Sacramento Mile presented by Cycle Gear on June 3 at 2:00 pm ET.